In part one of our two-part series on how we can help to make your next move a breeze the team of junk removal experts at Barten Bros recommended utilizing our skills to help you get rid of the things that you just don’t need anymore. It’s just a fact of life that we’ll all accumulate things and statistics show that most people move around 12 times on average. In other words, people have to get all of their belongings from Point A to Point B quite a bit! That’s why in today’s post we’ll pick up where we left off. Now that we’ve gotten rid of the junk that you don’t want to take with you on your move, what else can you do to make sure it’s a success? Keep reading to find out! One of the best things you can do is to start packing as early as possible. It might seem like you have a lot of time to get out of your current home but trust us when we say that that time will go very quickly. 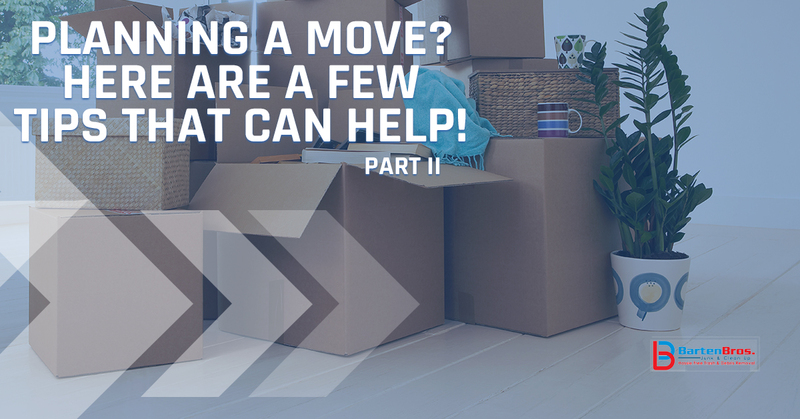 You don’t have to worry about packing up the things that you’re still using, but take the opportunity to pack up the things you will probably not have a use for until you’re in your new space. Things like movies, video games, clothes that are out of season, and the like all make for great things that are easy to pack now and will save you a lot of time later. As you start to get nearer to your move date be sure to pack a bag that contains all of the things you’ll need for the first few days in your new home. Your goal is to have the necessities at this point, so be sure to pack things like deodorant, toilet paper, clean towels for showering, body wash, shampoo, your toothbrush, toothpaste, medications, and a cell phone charger. The more you pack, the more organized you’ll want to be. Be sure to label your boxes as you go so that you’ll know exactly where they need to go in your new living space. Yes, it’s tempting to just pack together items that fit into the space you have in a box, but you’ll be thankful when all of your kitchen stuff is in one space and can easily be unpacked. Whether you’re having friends help you move or hiring a professional moving company, get it scheduled out at least a month in advance so you can plan accordingly. If your friends help, reward them with good food and drinks. If you enlist a moving company, be sure to leave a tip! Last, but not least you’ll want to make sure to transfer utilities to your new space, cancel the ones you won’t use, and make sure that everything is ready to go in your new space. Barten Bros is Here to Help! If you’re just getting the process started our team can help! When it comes to junk removal in Point Pleasant, we’re the team to turn to. Contact us today to get started with a free quote.